Andy will be the Homeowner for Habitat’s Annual Advocacy Build. This year, Habitat is working in collaboration with the Caribbean Policy Development (NGO) Centre to improve access to Housing and Land Tenure for Vulnerable Groups – the Disabled, People living with HIV/AIDS and the Gender Communities. We invite you to to join leaders of business, academia and government on October 13 at a special build project at Andy’s new home in Princes Town. Andy is deaf, his co-applicant Michael helped with the interview. Andy was eight years old and Michael was five when they met. Michael’s family opened a bookstore in Princes Town and there was a games arcade next door which Andy frequented. The boys began hanging out together and their friendship was born. Andy was an only child to his parents; his father was a mason by trade and his mother was a housewife. His home life was challenging, and as his parents passed away he spent more and more time in town at the bookstore. The owners would try to provide meals while he hung out with the staff and tried to help by moving boxes of stock. Later, a neighbour stepped in and assisted him with getting access to the disability grant on which he lives presently. When asked why he chose to get so intimately involved in Andy’s personal affairs, Michael said that he was approached for asssitance by one of Andy’s relatives – she wanted to get the property deed transferred from his mother’s name. Apparently there were several family members at that time trying to get Andy to sign a document that would make them the owners of the land. Michael said he found that to be wrong and he could not stand by and see that injustice done to someone he had known for almost all his life. The aunt who helped get the deed had intended to build him a small house with her own money; however she fell ill and had to use the money for her own care. 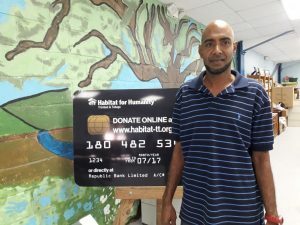 Asked why Habitat Trinidad and Tobago should assist Andy, Michael said that he knows him personally and he knows that he is a good person, he thinks it will be a blessing for him to own his own home especially when none of his relatives thought he could. He is very happy that an organization like Habitat TnT is available to bring hope to those who need it. Do you believe that everyone deserves a safe, decent and affordable place to call home? Have you experienced discrimination in housing because of a disability, your gender or your HIV status?